The value of an economic hub is its ability to draw in new resources and convert them to higher value products for exportation. The economic value of a system can be seen as the total value of exports minus the total value of imports. In other words, the cost of materials and production input should be of lower value than the export of higher end value products. Effective hubs create value by using their connections and resources in an effective manner to generate sustainable financial resources. Markets have large, medium and small businesses that contribute to the development of strong hubs through the interaction of resources, communication (business and social), and innovation that turns lower value inputs into larger exports. The more effectively the business and social community can work together the more the economic system can grow for the benefit of all members. In the diagram these transactions are noted in blue and may be larger or smaller based upon the value of the business relationships and the value of their transactions. When government runs efficiently and transparently the transaction costs of conducting business within a particular hub decreases. Where demographic and market information is easily accessible and transaction costs are low businesses will naturally be inclined to invest further in these lower risk markets. Larger businesses often rely on medium and small business to supply their needs as well as improve upon their capacities. For example, some small businesses may take over functions outside of the core competencies of the organization (i.e. maintenance) to help ensure strategic focus. Other businesses may provide new innovative concepts that larger businesses adopt, develop and export on a larger scale. Still others export in the niche market. Each relies on the other for success. Investment within proper infrastructure can reduce this costs by lowering taxes, increasing the speed of information transference, and furthering the interaction of business entities for development. Each infrastructure project should have goals and objectives to improve upon the social and business platform to spur greater economic growth. As activities and investment increases so will the life quality of the inhabitants. They will find improved services, employment opportunities, and greater options for personal advancement. Imports of materials, information, and knowledge denoted in red should be of lower value than the export of finished products and services denoted in purple. The value creation of the hub is based upon on how businesses and individuals use these resources to develop higher value products for exportation. Individuals invest their time and energy and companies invest their financial resources to develop better products and more opportunities. Labor, Management, and Investors have an inherent stake to produce value. Cities are generally the center of suburbs and are part of the same hub. In the global economy it is the larger macroeconomics of an area that takes precedence. The business, civic, and social connections will determine how effectively they can work together to solve problems and become economic viable. 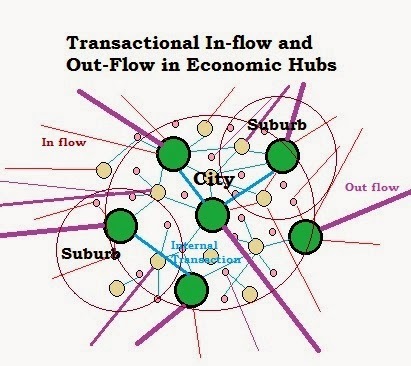 Some businesses will be located within the suburbs and others within the city but each is connected together through social and business connections that help ensure mutual self-interest in development. When they do not produce value or cannot create synergy they are considered dysfunctional. Constructive connections and financial interaction often leads to higher levels of economic activity for members.